The foods we eat have a deep and often surprising past. From almonds and apples to tea and rice, many foods that we consume today have histories that can be traced out of prehistoric Central Asia along the tracks of the Silk Road to kitchens in Europe, America, China, and elsewhere in East Asia. The exchange of goods, ideas, cultural practices, and genes along these ancient routes extends back five thousand years, and organized trade along the Silk Road dates to at least Han Dynasty China in the second century BC. Balancing a broad array of archaeological, botanical, and historical evidence, Fruit from the Sands presents the fascinating story of the origins and spread of agriculture across Inner Asia and into Europe and East Asia. Through the preserved remains of plants found in archaeological sites, Robert N. Spengler III identifies the regions where our most familiar crops were domesticated and follows their routes as people carried them around the world. 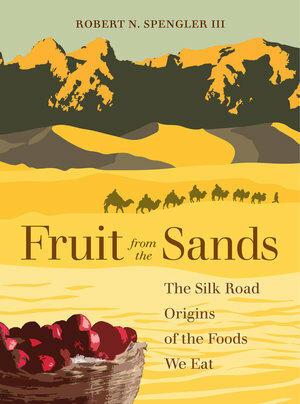 With vivid examples, Fruit from the Sands explores how the foods we eat have shaped the course of human history and transformed cuisines all over the globe. Robert N. Spengler III is the Archaeobotany Laboratory Director at the Max Planck Institute for the Science of Human History, a Volkswagen/Mellon Foundations Fellow, and a former Visiting Research Scholar at the Institute for the Study of the Ancient World.